President Trump speaks at a campaign rally in Montana on Thursday. His summer was marked by tweeting insults about black Americans who criticize him and praise for black celebrities who back him. Nearly 50 tweets were focused on a black person or black Americans in general, with 20 of those tweets negative in tone. Trump started off his summer clashing with the Super Bowl champion Philadelphia Eagles over NFL players protesting during the national anthem. These protests have been mostly carried out by black players with a goal of bringing awareness to police brutality. In a tweet in early June, he announced he was canceling the traditional celebration for the championship team at the White House because he claimed most players were not going to show up because they disagreed with his criticism of kneeling during the anthem. Opposition to the NFL protests has become a rallying cry for Trump with his base. Critics argue he has used the issue to stoke racial divisions. In August, Trump tweeted that most of the protesting athletes can't even "define" what they are outraged about. This was not the only time this summer that Trump seemed to question the intelligence of notable black Americans. He repeatedly lashed out at U.S. Rep. Maxine Waters, a black Democrat from California, who has been highly critical of Trump and his policies. On Twitter, Trump called Waters an "extraordinarily low IQ person," "crazy" and "unhinged." In other tweets, Trump would also attack the intellect of former White House aide Omarosa Manigault Newman, NBA superstar LeBron James and CNN anchor Don Lemon. Trump fell out with Manigault Newman over the release of her book, Unhinged, in August, which painted a scathing portrait of his White House. He railed against Manigault Newman over the course of several days on Twitter, even calling her a dog in one tweet. The dehumanizing language Trump used about Manigault Newman and other black celebrities cannot be disconnected from this country's history of racism and discrimination against black Americans, said Ian Haney Lopez, a law professor at the University of California, Berkeley. "The language connects up with some of the deepest stereotypes about race that suffuse our culture," Haney Lopez said. "All of this is really playing into this ugly sense that some people aren't really valuable as people. And again this is a set of ideas that run deeply in our society." Haney Lopez is the author of the book Dog Whistle Politics: How Coded Racial Appeals Have Reinvented Racism and Wrecked the Middle Class. Facing questions about Trump's disparaging tweets, White House officials have defended the president's comments. White House spokesman Hogan Gidley says the tweeted insults have nothing to do with race. "By now, everyone understands President Trump is a counter-puncher and will defend himself against countless, unfounded, ridiculous attacks," Gidley said in a statement. One striking aspect of Trump's political rhetoric is that much of it seems to be a throwback to the 1980s and 1990s. His go-to phrases for endorsing Republican candidates for midterm elections are "tough on crime" and "strong on crime" — he used the phrases more than 30 times this summer. To draw a contrast, he typically calls Democrats "weak" on crime or the border. But, in the case of Stacey Abrams, the Democratic candidate for governor of Georgia, Trump deviated from this pattern. He did not use her name, but he described Abrams, who is African-American, as "crime loving." Asked about the decision to aim such charged language at Abrams, Gidley said the tweet was not really specifically aimed at Abrams, but was meant to address Democrats generally. 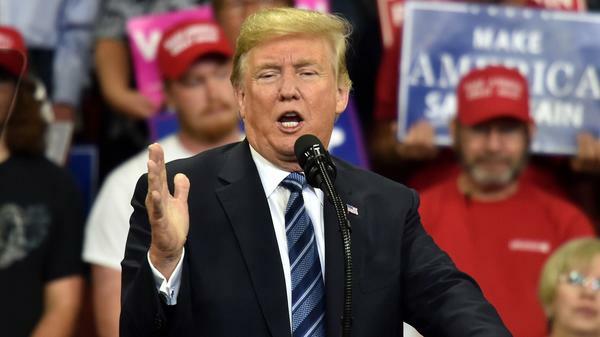 But Haney Lopez says Trump does not deserve the benefit of the doubt on these matters, especially when he was an outspoken promoter of false allegations that former President Barack Obama was not born in the United States. "The presumption should be that Trump is as he has been for months, as he has been since his birther campaign, that Trump is intentionally engaging in racially provocative language," Haney Lopez said. "And if he wants to suggest that he's not, the burden of proof should be on him and his administration." Trump's defenders often point to the fact that he attacks people of all races on his Twitter feed as evidence that he is not acting out of animus against black people. Over the past three months, Trump has lashed out at a number of people who have aggrieved him — black and white. One of his most common put-downs still happens to be "crooked," the derogatory nickname he assigned his former presidential rival, Hillary Clinton. He referred to Clinton with that insult 26 times. "Privately, I've seen a man who really treats everybody the same regardless of color, and that's the God honest truth," said Mark Burns, a black pastor who is a member of Trump's informal evangelical advisory panel. "What I've discovered is he is an equal opportunist when it comes to really rebutting any attacks that he might have received." Trump does have kind words for those black politicians whom he views as on his team, including John James, a black Republican Senate candidate in Michigan. James was the only candidate this summer whom Trump called "spectacular" in all caps in his endorsement tweet, which also mentioned that James was an African-American leader. Trump also seems to relish highlighting any black celebrity who voices support for him. He bragged on Twitter about receiving compliments from rapper Kanye West, football legend Jim Brown and golfer Tiger Woods. Many of these tweets highlighting black celebrities that back Trump also mentioned that black unemployment has fallen to record lows since Trump became president. Trump constantly mentions the African-American unemployment numbers when making the case for the success of his tenure so far. The ubiquitous talk of black unemployment is a way to shield Trump from accusations of racism, says Clarence Lusane, chair of the political science department at Howard University. "The target is really white voters who are going to be uncomfortable with thinking that they're voting for an overtly racist president," Lusane said. "When Trump talks about black unemployment he is not talking to black people. He's talking to the white voters that they don't want to scare away as they head into the 2020 election." Trump's rhetoric this summer does not seem to have helped his standing with the black community. An ABC News/Washington Post poll released in late August found Trump's approval rating with African-Americans was just 3 percent.